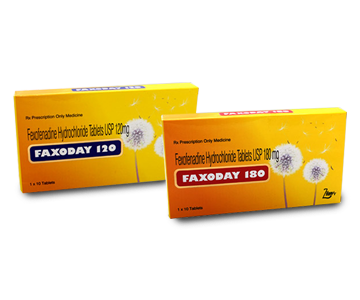 Fexofenadine is an antihistamine with selective peripheral H 1- receptor antagonist activity. It inhibits antigen-induced bronchospasm in sensitized guinea pigs and histamine release from peritoneal mast cells in rats. Seasonal Allergic Rhinitis: For the relief of symptoms associated with seasonal allergic rhinitis in adult and children above 6 years. Symptoms treated effectively were sneezing; rhinorrhea; itchy nose, palate, throat; and itchy, water red eyes. 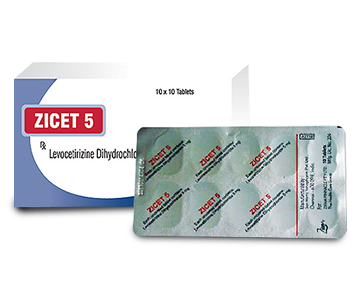 Chronic Idiopathic Urticaria: For treatment of uncomplicated skin manifesttaions of chronic idiopathic Urticaria in adults and children above 6 years. 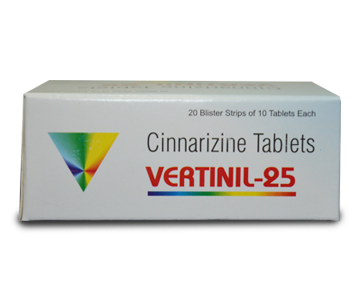 It significantly reduces pruritus and the number of wheals. Adults and children above 12 years: Recommended Dose: 120 mg once daily. A dose of 60mg once daily is recommended as the starting dose in patients with decreased renal function. Children 6-11 years: Recommended Dose: 30mg twice daily. A dose of 30mg once daily is recommended as the starting dose in pediatric patients with decreased renal function. Reports of fexofenadine HCI overdose have been infrequent. In the even of overdose, consider standard measures to remove any unabsorbed drug. Symptomatic and supportive treatment is recommended. Patients with known hypersensitivity to any of the ingredients of Alerday. Carcinogenicity, Mutagenicity &Impairment of Fertility: No evidence of carcinogenicity or mutagenesis and reproductive toxicity was observed even on prolonged use of fexofenadine HCI. Pregnancy Category C: There are no adequate and well controlled studies in pregnant women. Fexofenadine should be used during pregnancy only if the potential benefit justifies the potential risk to the foetus. There are no adequate and well-controlled studies in women during lactation. Because many drugs are excreted in human milk, caution should be exercised when fexofenadine HCI is administered to a nursing woman. Adverse effects reported in clinical trials with Fexofenadine are mild and infrequent and include headache, nausea, dyspepsia, drowsiness, dizziness and fatigue. Erythromycin or ketoconazole-concurrent administration with fexofenadine has been found to increase plasma fexofenadine concentrations; however, no differences in adverse effects or increased QT intervals were seen. Antacids, aluminum and magnesium hydroxide-containing-administration of fexofenadine within 15 minutes of dosing with an aluminium and magnesium hydroxide-containing antacid has decreased the fexofenadine AUC by 41% and Cmax by 43% Alerday should not be taken closely in time with aluminium-and magnesium-containing antacids.